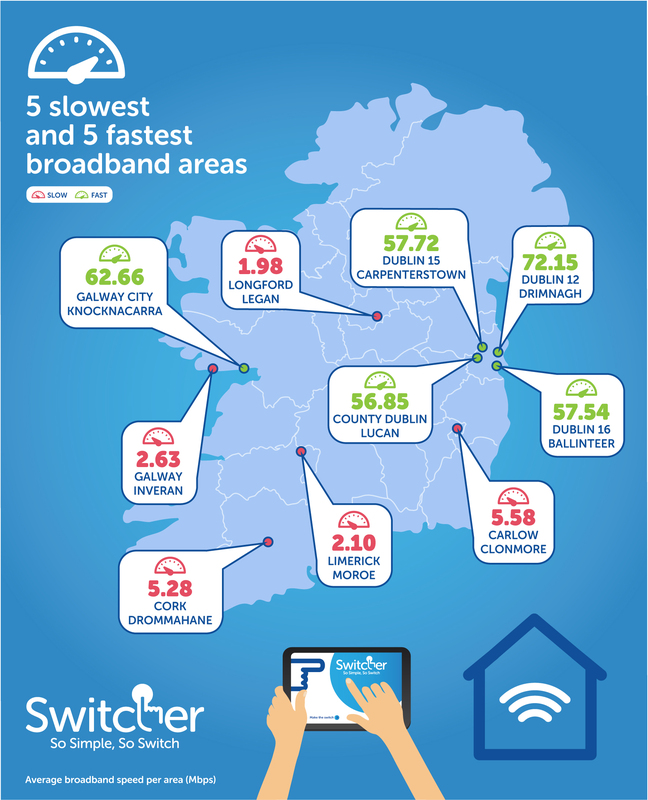 Speed test data collected by Switcher.ie shows that broadband speeds vary hugely across the Republic of Ireland, and some areas are being left languishing with speeds up to 36 times slower than those in the fastest parts of the country. The data, based on almost 27,000 consumer speed tests run by broadband users between 1 August 2015 and 31 July 2016, shows that Legan in Longford is officially the slowest area, with average broadband speeds that are 36 times slower than Drimnagh in Dublin 12 – the fastest area – and almost 12 times slower than the national average. In terms of county-by-county results, unsurprisingly Dublin has the highest average speed, followed by Waterford, Kildare, Meath and Westmeath. The county with the slowest average speed is Longford, with Leitrim, Roscommon, Monaghan and Mayo making up the bottom five. The National Broadband Plan sets out that, at a minimum, broadband with speeds of 30Mbps should be available to all. The data shows that, of all tests collected throughout the period, only 25% of tests had speeds of 30Mbps or more ( 6,741 out of 26,829 tests showed download speeds of over 30Mbps). However, it’s not all bad news, as there were ‘lightning’ speeds recorded, too. The highest speed out of all the tests was 989.15Mbps, which was recorded in Ballon in Carlow. This clearly demonstrates the progress that has been made so far in terms of quality broadband access, and the potential impact once the National Broadband Plan is rolled-out. Aside from the type of connection you have and where you live, there are a number of other factors that can affect the speeds you can achieve, for example distance from the exchange, where the router is placed within your home and even the time of day you use the internet. Whether or not you’re connected directly to the router or using WiFi will also have an impact, as will the device you’re using. Commenting on the findings, Eoin Clarke, Managing Director of Switcher.ie, said: “The results from the speed test data highlight the digital divide in Ireland. We’re seeing lightning speeds in certain areas, largely where there has already been investment made in fibre to the home networks. However, in many areas we are still a long way off these kinds of speeds and slow broadband is a frustration that thousands of people in these places have to deal with every day. “In practical terms, it would take someone living in Legan in Longford over three and a half hours to download a 2-hour HD movie, while people in Drimnagh in Dublin 12 can do this in just under 6 minutes. This is a stark difference that could have a real impact on quality of life for people in areas with sluggish speeds. And it can have an impact on house prices, education and local business, too.